There’s been a lot of effort to restore Mexican Wolf populations. Below are some articles on the issue. Peter M. Ossorio is a retired federal prosecutor and serves on the UJI Criminal Committee. This is not a dispassionate casenote. Since 1999 my wife and I have tent camped over 358 nights and seen over 42 lobos (Canis lupus baileyi), usually for seconds and always at over 100 meters — even when we had corned beef hash on the stove. This article illustrates how the Endangered Species Act (ESA), 16 U.S.C. §§ 1531-44, is not self-enforcing – and how litigation has prompted every major step taken by the U.S. Fish & Wildlife Service (“Service”) in the last 25 years to reintroduce lobos, plan for their recovery, and promulgate rules supporting that recovery. In 1973 President Nixon signed “the most comprehensive legislation for the preservation of endangered species ever enacted by any nation.” Tenn. Valley Auth. v. Hill, 437 U.S. 153, 180 (1978). In 1976, the Service listed the lobo as an endangered species – but there were none left in the United States to protect; salaried federal agents had killed them all. Michael J. Robinson, Predatory Bureaucracy: The Extermination of Wolves and the Transformation of the West, 338 (Univ. of Colorado Press 2005) [hereinafter Robinson]; U.S. Fish & Wildlife Serv. Region 2, Mexican Wolf Conservation Assessment 20-21 (Albuquerque, N.M. 2010), http://www.fws.gov/southwest/docs/41948WollfConservationAssessment4-2010.pdf [hereinafter Conservation Assessment]. [ii] Ignoring the irony, the Service hired one of the trappers responsible for that situation to bring back lobos from Mexico. “Nina” was the last female caught in the wild — anywhere. For two years she did not breed in captivity. At nine years she conceived. The sire of her miracle litter, the last wild-caught unrelated male, died before she gave birth. That’s how close the Service and its predecessor agency, the Bureau of Biological Survey, had come to wiping out the lobo. See Robinson, supra, at 157,187 & 349. El lobo is not the gray wolf (Canis lupus) reintroduced into the Northern Rockies. C.l. baileyi is a genetically distinct, smaller (50-90 pounds) and much rarer subspecies. Unlike its northern cousins, the lobo has no genetically diverse “source” population of thousands of wolves in Canada. Dependent upon only seven “founders,” the lobo’s reprieve from extinction came with a genetic bottleneck and a time bomb of inbreeding depression. Robinson, supra at 349-50; D. Peter Siminski, Mexican Wolf Canis lupus baileyi International Studbook 3 (Palm Desert, California 2015); Conservation Assessment, supra at 8, 11-13. This urgency permeates every aspect of the politics and policies affecting them – and motivates lobo advocates. In 1981, Nina whelped in captivity and the Service convened a binational recovery team. In 1982 the Service released the first – and 34 years later only — recovery plan. With hand-drawn sketches of den boxes, it focused on the uncertain prospects for breeding captive lobos, saw “no possibility for complete delisting of the Mexican wolf,” and adopted an explicitly inadequate initial goal of 100 wolves in the wild. Robinson, supra at 349; Conservation Assessment, supra at 21-23; U.S. Fish & Wildlife Svc., Mexican Wolf Recovery Plan 22, 23, 32, 88-89 (Albuquerque, N.M. 1982), http://www.fws.gov/southwest/es/mexicanwolf/pdf/Mexican_Wolf_RP_1982.pdf. [hereinafter 1982 Recovery Plan]. The Service slowly considered reintroducing lobos. By 1986, it had accepted Texas’ veto of any reintroduction there and obtained permission for reintroductions on White Sands Missile Range, but not for the far better wolf habitat in the Gila National Forest. Robinson, supra at 351-52. Believing the Service planned “to erect a series of obstacles . . . and eventually thwart” recovery, and seeing no revised recovery plan after eight years, six conservation organizations sued. Robinson, supra at 353; Wolf Action Group v. Babbitt,No. CIV-90-0390-HB (D.N.M. 1990). In 1998 the Service issued a “10(j) rule” providing for lobos to be reintroduced to the wild as a nonessential experimental population with a projection of 102 wolves in the wild after nine years. See U.S. 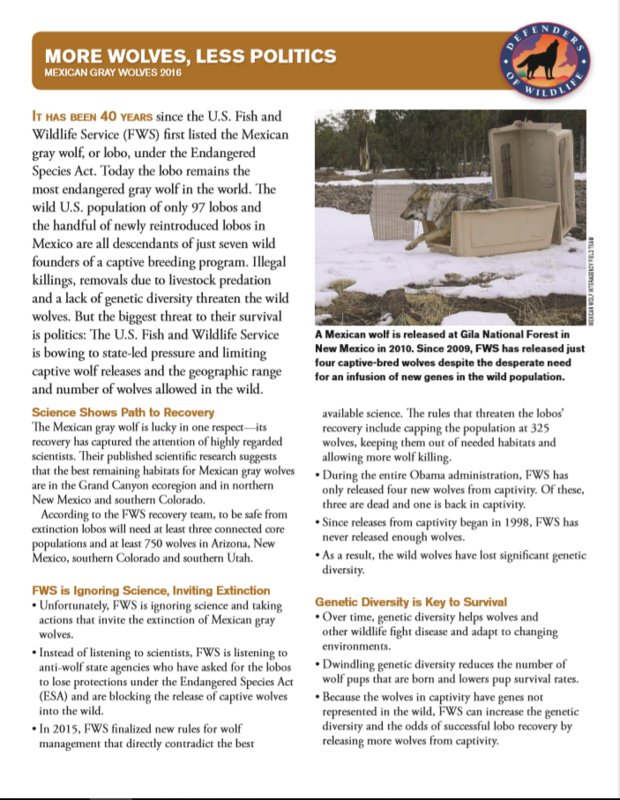 Fish & Wildlife Serv., Reintroduction of the Mexican Wolf within its Historic Range in the Southwestern United States, Final Environmental Impact Statement, Region 2, 2-8, Table 2-2 (November 6, 1996),http://www.fws.gov/southwest/es/mexicanwolf/pdf/MW_EIS.pdf. Although the Service said it would release a draft (new) recovery plan later the same year, it never did so and now – after being sued in 2014 — says the plan will be released in 2017! 63 Fed. Reg. 1752, 1753 (Jan. 12, 1998), http://www.fws.gov/southwest/es/mexicanwolf/pdf/10(j)_Final_Rule.pdf. ; http://www.fws.gov/southwest/docs/MexicanWolfRecoveryProgramAppealHearingUSFWS27Aug2015.pdf. In March 1998, the Service turned loose into the only authorized small area in Arizona, 11 captive bred lobos. They quickly learned to kill elk – but suffered five illegal shootings. Several survivors were captured, paired with new mates, and eventually re-released. Despite illegal shootings, and other casualties, the population dispersed into both Arizona and New Mexico and grew precisely as predicted through the 2003 end-of year count of 55. U.S. Fish & Wildlife Service, Mexican Wolf Blue Range Reintroduction Project Statistics, 1998-2014, http://www.fws.gov/southwest/es/mexicanwolf/pdf/MW_popcount_web.pdf. Between 2003 and 2008 the population stagnated. Id. This coincided with the Service’s ceding lobo management to a six-agency Adaptive Management Oversight Committee (AMOC). The AMOC issued an inflexible “three-strikes” policy (SOP 13) requiring removal of lobos, no matter their maternal status or genetic value, who had killed three head of livestock within 365 days. In 2008, nine regional and national conservation organizations sued. Defenders of Wildlife. v. USFWS,No. 08-cv-280-TUC-DCB (D. Ariz. 2008) (lead case) and WildEarth Guardians v. USFWS No. 08-cv-820-TUC-DCB (D. Ariz. 2008) (consolidated case). In 2009 the Service agreed to scrap SOP 13 and accepted that “the AMOC has no decision-making authority over the Service with regard to the Service’s management of the Mexican Wolf Recovery Program or the Mexican Wolf Reintroduction Project.” Id., Decree at 5 (Dec. 13, 2009). Subsequently, the wild population began to rise, but well behind schedule; the original, necessary but insufficient, 1982 recovery plan objective was not achieved until 2014, when the end of year count reached 110. Project Statistics, supra. Meanwhile, in 2004, the Center for Biological Diversity petitioned the Service to amend the 1998 rule to incorporate recommendations from scientists who called for allowing direct releases of lobos into New Mexico and for erasing imaginary lines on a map which subjected dispersing wolves to automatic removal – even if they were causing no problems. In November 2012, after eight years with no definitive action by the Service, the Center filed a formal complaint. Center for Biological Diversity v. Jewell, No. 1:12-cv-1920-RCL (D.D.C. 2012) On July 29, 2013, the parties agreed the Service would publish its final determination concerning modifying the 10(j) reintroduction rule on or before January 12, 2015. Id., Doc. 22, at 2. The Service met its deadline. The current rule does expand the area within which lobos may be reintroduced and disperse. However, it also retains I-40 as an invisible fence, denying lobos the suitable wolf habitat in northern Arizona, Utah and Southern Colorado that the science team for the Service’s third – and now frozen – recovery planning team says is necessary for a meta-population of three distinct but genetically connected populations. See 80 Fed. Reg. 2512, 2559-60 (Jan. 16, 2015) (to be codified at 50 C.F.R. pt. 17); U.S. Fish & Wildlife Svc., Science and Planning Subgroup, Draft Mexican Wolf Revised Recovery Plan 12 Sept. 16, 2011) (unofficial document disclosed by Commissioner Jack Hustead, Arizona Game & Fish Meeting (Dec. 2, 2011) (on file with author); Senator Orin Hatch, Opinion, Mexican Wolves Don’t Belong In Utah’s Dixie, St. George News, Oct. 25, 2011, http://www.stgeorgeutah.com/news/archive/2011/10/25/mexican-wolves-dont-belong-in-utahs-dixie-opinion/#.VhrjOflViko Further, the new rule places a cap of 300-325 wolves in Arizona and New Mexico, combined – far below the approximately 750 wolves the science team says is needed for survival. 80 Fed. Reg., supra at 2563; WildEarth Guardians v. Ashe, Complaint ¶27, No. 4:15-cv-00285-JGZ (D. Ariz. Jul. 2, 2015) (best available science calls for a metapopulation of three interconnected subpopulations, totaling 750). In November 2014, after three false starts by the Service to update the 1982 Recovery Plan, two conservation organizations and – for the first time – two captive breeding facilities and the original Mexican Wolf Recovery Coordinator filed a complaint alleging the Service is violating the 16 U.S.C. § 1533(f)) by failing to prepare a legally sufficient recovery plan and that its failure, after 32 years, is “an agency action unlawfully withheld or unreasonably delayed” under 5 U.S.C. Defenders of Wildlife v. Jewell, No. 4:14-cv-02472-JGZ (D. Ariz. 2014). In March 2015 the Center and Defenders sued the Service over those portions of the new rule allowing increased take (killing), blocking lobos from north of I-40, and capping the population at 300-325. Center for Biological Diversity v. Jewel, No. 4:15-cv-00019-TUC-JGZ (D. Ariz. 2015). In July 2015, three conservation organizations sued to designate the now fourth and fifth generations of lobos in the wild as “experimental essential,” i.e. asserting the loss of the entire U.S. wild population would be “likely to appreciably reduce the likelihood of the survival of the species in the wild.” H.R. Conf. Rep. No. 97-835, P.L. 97-304, p. 34, Sept 17, 1982, Cong. Record Vol 128 (1982), reprinted in 1982 U.S.C.A.A.N. 2807, 2875 (definition adopted by the Service in its 1998 rule in 50 CFR 17.80(b)). WildEarth Guardians v. Ashe, No. 4:15-cv-00285-JGZ (D. Ariz. 2015). On February 18, 2016, the Service released its end of year count for 2015. After a full year under the “new” reintroduction rule, instead of increasing by 10% as projected in the EIS the population plummeted from 110 to 97 – a figure which failed to include two alpha females who died after being captured during the count. So it goes . . . .
[i] This article is dedicated to men and women of the Interagency Field Team (IFT) – federal, state, and volunteers – who do not quit on the week-ends as they strive to recover the lobo. Comments are welcome: peterossorio@centurylink.net. 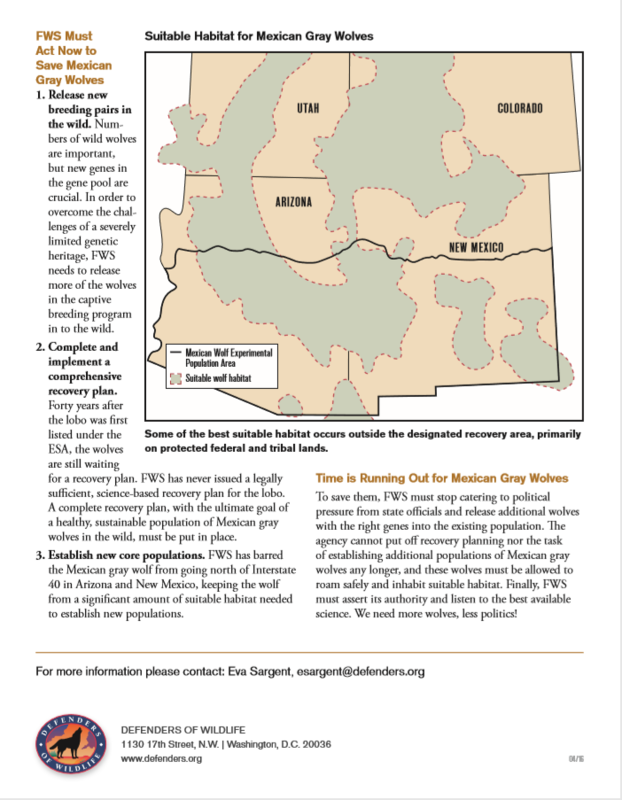 [ii]In addition to the USFWS website, supra, see Arizona’s significant contributions at https://azgfdportal.az.gov/Wildlife/SpeciesOfGreatestConservNeed/MexicanWolves/. For additional information about lobos from a consortium of conservation groups, visit www.mexicanwolf.org.